Cristiano Ronaldo is still waiting for his first competitive goal in Italy but the Portuguese superstar made a 2-0 winning home debut with Juventus as Carlo Ancelotti’s Napoli came from two goals down to beat AC Milan 3-2 in the second round of Serie A action. 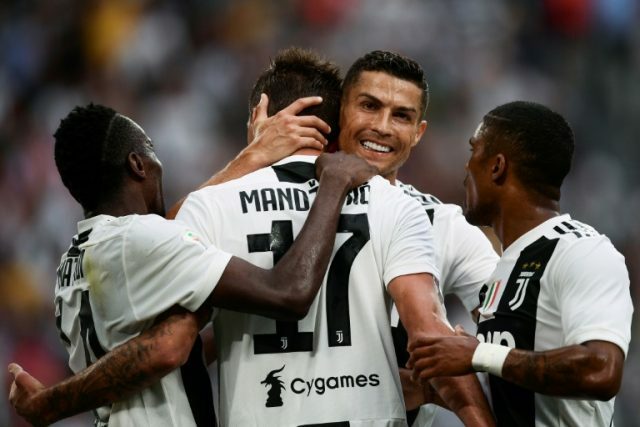 Ronaldo, 33, unintentionally played a role in Mario Mandzukic’s second goal of the night on 75 minutes after Miralem Pjanic put the hosts in front at the Allianz Stadium. The five-time Ballon d’Or winner joined the Serie A champions from Real Madrid in a 100-million-euro deal. Lazio — fifth last season — have had their worst start in over a decade following last weekend’s 2-1 defeat at home against Napoli. “He is the the best player in the world. For us it is something exceptional, we are very happy to play with him,” said Matuidi of Ronaldo. “Of course we’re going to help him, we’re going to help him score goals.. In Saturday’s second Serie A game, Ancelotti got his first home win as Napoli coach as the southerners fought back from two goals down to edge AC Milan. Giacomo Bonaventura sensationally opened for Milan after 15 minutes in the San Paulo Stadium with a Davide Calabria half-volley giving the visitors a two-goal advantage four minutes after the break. But last season’s runners-up turned it around in a second half with Piotr Zielinski bagging a brace and Dries Mertens sealing victory. Ancelotti spent most of his career at AC Milan with the 59-year-old winning three Serie A and four European titles as a player and coach with the northern giants.